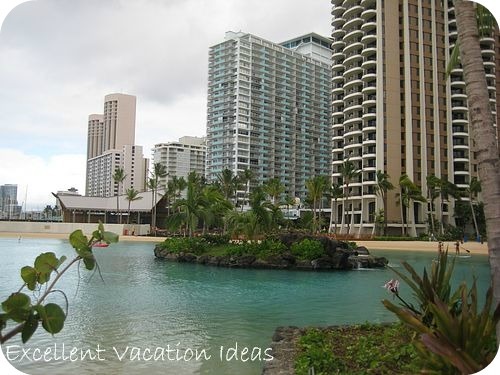 Hilton Hawaiian Village Hawaii. There are so many options for dining at the Hilton Hawaiian Village that you won't have time to eat at them all. With so many different options for dining at the Hilton Hawaiian Village - from room service to fine dining to sushi and Japanese to the pool bar and grill, you will have a hard time choosing if you like variety in your diet. These are our experiences from when we visited in January of 2009, we were there for our friends wedding. We ate most meals in the restaurants on property and were unable to try all the restaurants they offer. An open aired dining room, overlooking the beach and ocean in the Rainbow Tower. The sunset from here was spectacular and Chef Francois Bougard really outdid our expectations the evening we dined there for our friends wedding dinner. This was by far our favorite dinner while visiting the Hilton Hawaiian Village Hawaii. The service was impeccable (thanks Andre!) and the food was amazing. The chef does a soup - Maui Onion Soup - that is far from a traditional onion soup. It has layer upon layer of flavor - everyone loved it. I had the Filet Mignon and Warren had the fish - It was incredible. Then wedding cake for desert - yum and for a finale - Chocolate Truffle erupting Diamond Head Volcano with smoke and everything! - check out the video! The kids were ecstatic! A traditional American steak and seafood restaurant. We ate here the night before the wedding so we could all get to know each other. This restaurant is also located in the Rainbow Tower but it overlooks part of the beach and the lagoon. The food was good but the service was slow. We requested an outside table and the accommodated us - even though we were a table of 10. I had the a seafood medley - scallops and shrimp and Warren had the steak. A few others in our group had the mahi mahi and really enjoyed it! For dessert some had the bananas foster and caramel mouse and thoroughly enjoyed it. Overall the experience as ok. The American Franchise was good - experience was just like any other Benihana - Food was good and generous and the service was amazing. Our waitress was awesome and took great care of us. At the end they brought Michelle and Andy a candle to blow out and sang them a Japanese wedding song. It was neat as the people at the end of our table were from Japan (didn't speak much English) and sang along with the staff. It was a great last night dinner. 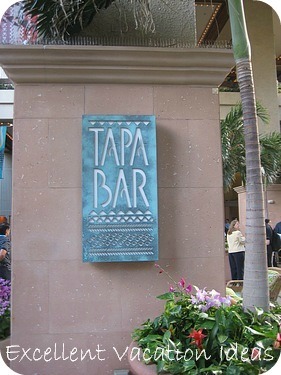 We had breakfast in the Tapa Cafe most mornings. They offer menu service and a hot and cold buffet. Some mornings the service was great - others it was slow. The food on the buffet was good but it was expensive - $20 for the continental buffet and $30 for the hot buffet. Typical hotel prices for buffets. We usually eat cereal in our room - but we wanted to eat with our friends so we went there a few times. Hatsuhana is a sushi restaurant in the shopping area. Sushi was good but a little expensive and they had a great kids option and stickers for them to play with. This restaurant was great for a quick meal. 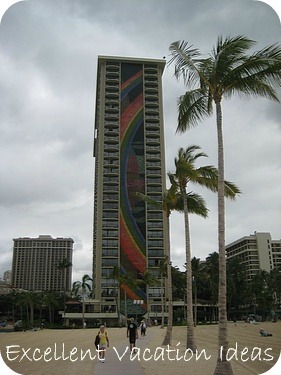 The Rainbow Lanai located in the Rainbow Tower is another option for breakfast. Warren ate there with the boys on the morning of the wedding and said it was good. We also ate there for dinner on our last night there before we left on our 9 pm flight. They offered a menu and a buffet. If you arrived for the buffet before 6 pm then you would get a discount. The food was ok - I just wanted a burger and it was good. - the views were amazing as was the sunset! There are many other options including the hundreds of restaurants in the vicinity. 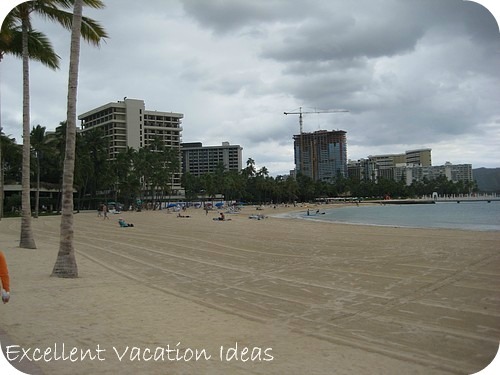 The widest stretch of Waikiki Beach is in front of this hotel complex. Here you can swim, learn to surf, play with the kids in the surf, sunbathe, or walk the beach almost to Diamondhead.